Non-uniform day for Easter! Bring a chocolate treat for the Easter Fair! 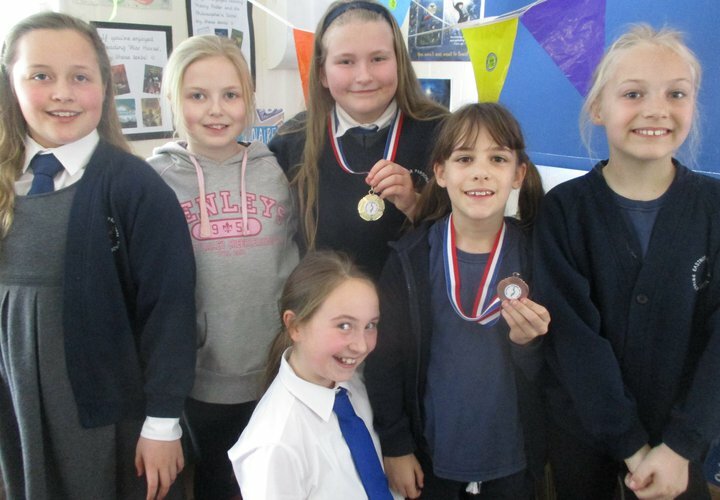 All of KS2 will be taking part in the Poetry Outloud Festival on Tuesday 2nd April at Hellens House in Much Marcle. The project is organised by Ledbury Poetry Festival and we will be working with several poets on the day, as well as watching a great performance by them all. The children will take part in workshops run by Mike Barfield, Valerie Bloom and Sarah Hirsh. Later in the day the children will have the opportunity to perform the poems they have written. 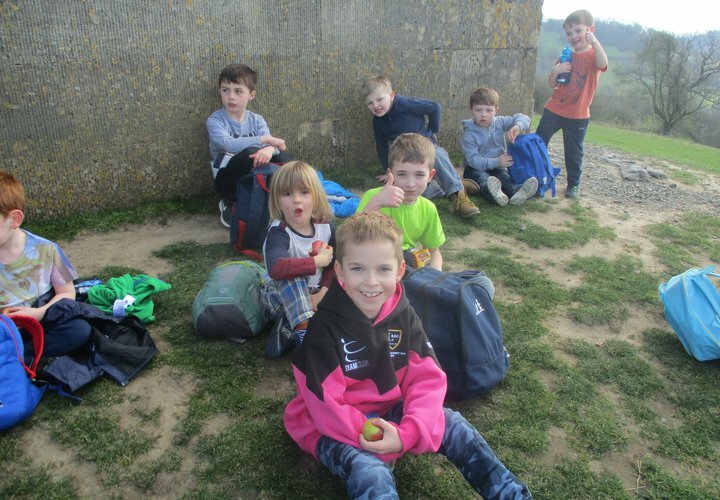 The children need to be dropped off at Hellens House 9.20am to start at 9.30am promptly. They then need to be picked up from Hellens at 3.15pm. Please come and see Miss Clark or Mrs Tart if you need help with these travel arrangements. On Thursday 4th July we are giving all children the chance of coming to school in home clothes. If they do, in return, we request they bring in a small 'chocolate treat' as a contribution to be used as a prize at our PTA Easter fair. Please remember that children in classes 3 and 4 will still need PE kit for lessons in the afternoon. End of Year Production Auditions! On the afternoon of Thursday 4th April, we will be holding auditions for our annual end of year production. We are organising things slightly differently this year! Most notably, we are keeping the identity of the production under wraps until after auditions. Children will need to learn a short piece of prose (which will be avaliable next Monday) to perform at the audition and can also sing a short section of a song acapella - no more than one minute please - if they would like to showcase their musical talents too, but this is optional. We want to see as many children from KS2 as possible at the auditions and can’t wait to get started on preparing another memorable production. Life Education Bus comes to Eastnor! Next Friday - at the third attempt!- all of the children will have chance to take part in some memorable life skill sessions which will be delivered in a special mobile classroom outside school. They will meet Harold the Giraffe puppet (‘Healthy Harold’), and friends and learn about health, well being and drugs education. These sessions will be delivered in a fun, engaging and age appropriate way by Coram Life Education, leading providers of health education for children. We are very lucky to be working with Coram Life Education, as it would be cost prohibitive to host the event on our own. Our thanks go to Ledbury Rotary Club who are funding it for us! On Tuesday 8th April KS2 children have a real treat awaiting them at Ledbury Church. The event has been kindly organised by our wonderfully dedicated Open the Book team who are all volunteers. Experiencing Easter is an event planned for children to interactively engage with the Easter story through a variety of activities, bringing the significant story to life. 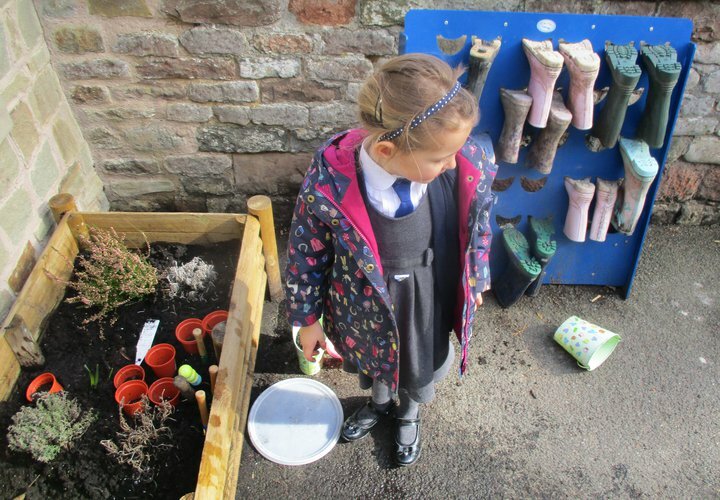 I am sure the children will enjoy the experience, bringing back lots of knowledge and understanding to share with the younger children in the school. A parent mail will follow with details regarding pick ups from Ledbury. Please come along to support the PTA at our Easter Fair (which will take place straight after the Easter service) with games, crafts and refreshments. In place of a raffle, we are doing a Buy A Square @ £5 per number (1 – 100 available). Please send in your money to school office ASAP with your name and any preferred number(s). If the number you want has been taken, a random one will be allocated. The number board is now displayed in the entrance to school. The draw will take place at the Easter Fair on Wednesday 10th April. 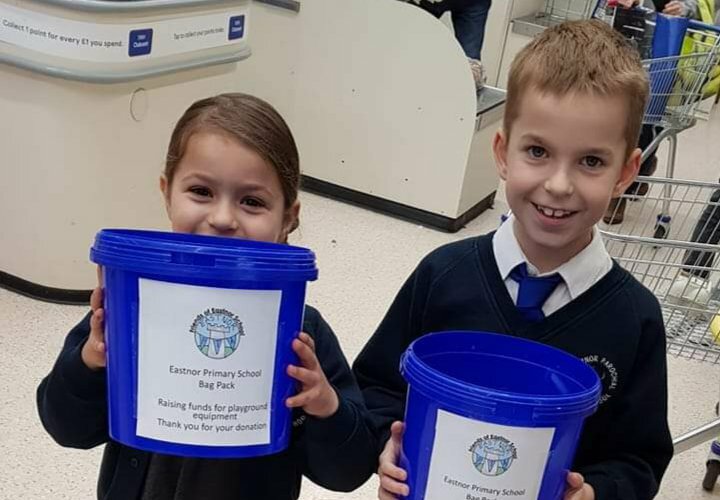 In the run up to the Easter Fair, the PTA are having a Non-Uniform day on Thursday 4th April with donations of chocolate to be brought in on the day. If anyone would like to help at the Easter Fair, please contact either any PTA member or the school office. 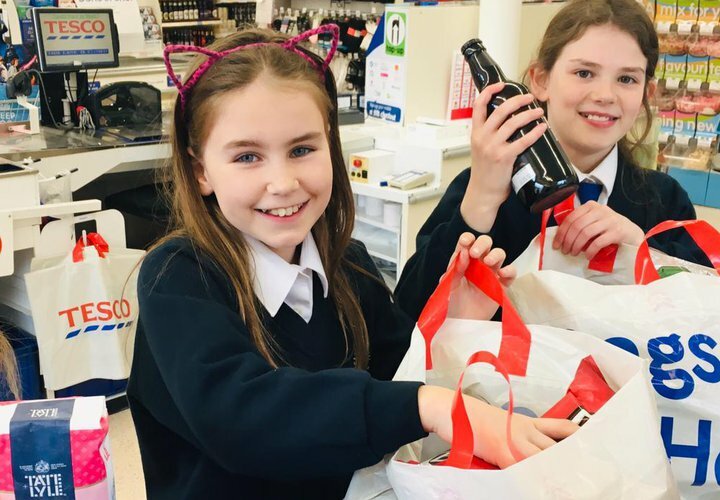 Last Saturday, many of the Eastnor children gave up their own time to help customers at the Tesco store in Ledbury. As they helped to pack bags, the children charmed the customers and the donations to the school's PTA came flooding in. The customers all spoke very highly about the children and many were real advocates of our highly regarded school. The event raised over £700 which will benefit all of the children in school very soon. Many thanks to Helen Mitchell for organising the event and to the adults who supervised the children throughout the day. Most of all, my thanks go to Nancy and Heidi, Jayden and Milly, Lilly and Freya, Lily and Rosie, Eleanor and Tom, Benjamin S, Lewis, Joseph K and our youngest helpers William and Mollie from class 1! All of the children who helped enjoyed a small tea party with Mrs Driscoll on Friday lunchtime which was very enjoyable in the sunshine! 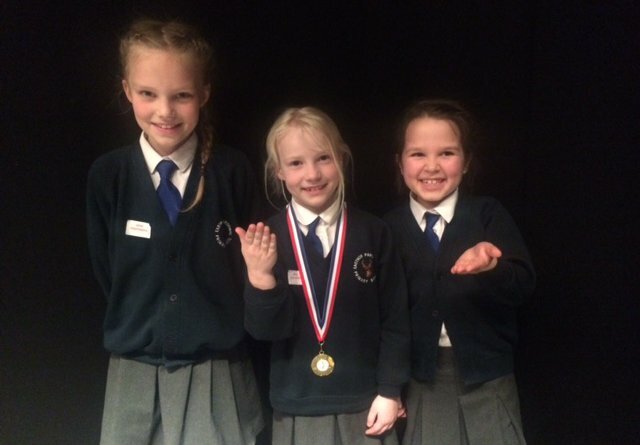 This week, children who chose to attend our Performing Arts Club have been performing their poems at the Herefordshire Performing Arts Festival. On Monday Anna, Goda and Rosie showcased their poems at the Courtyard Theatre and on Tuesday Eva, Emily, Libby, Lily and Eleanor performed at Saxon Hall and Heidi at St Johns Church. The Christian value of courage springs to mind when I see our brave children step up to recite poems to a packed auditorium. However, stepping out of our comfort zone and trying something new is character building and the elation on everyone's faces when they have performed is wonderful to see. All of the children received very positive comments on their certificates and we even had some medal winning performances. Rosie from year 3 was awarded the gold medal in the 7 year of age competition and Libby and Eleanor were awarded gold and bronze in the 10 years of age class! 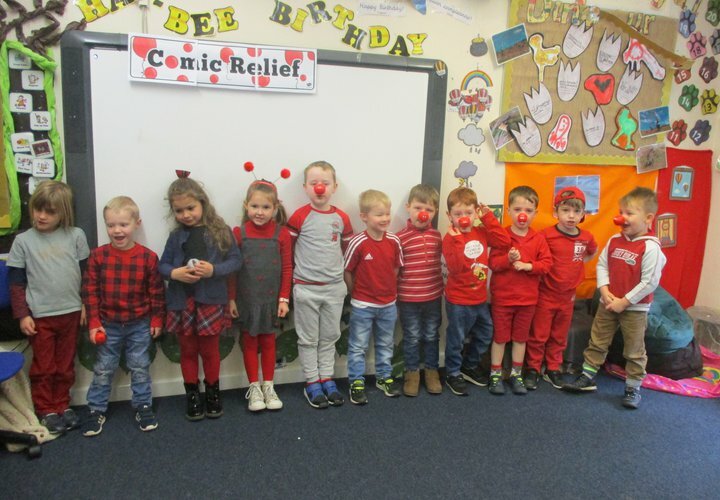 Many thanks to Katie Balson who helped the children prepare for the Festival and to all parents who assisted with lifts and supported the children. What a wonderful achievement for everyone involved! 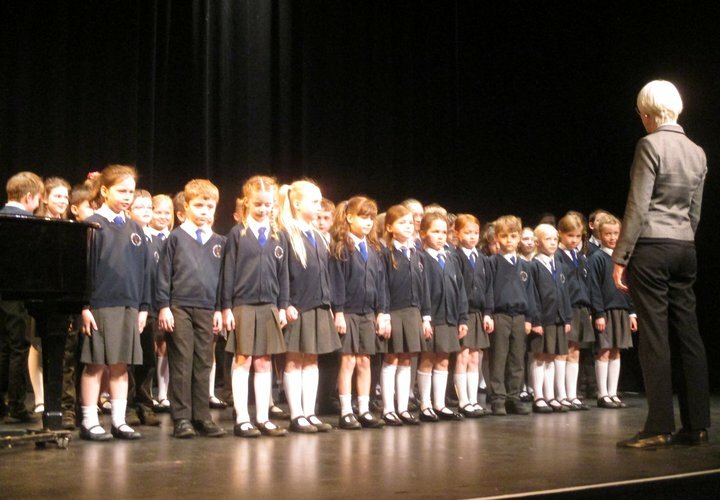 On Tuesday, our KS2 choir ventured to The Courtyard in Hereford to take part in the Key Stage 2 choir category for the Herefordshire Performing Arts Festival. We sang a set piece called "The Skye Boat Song" which is a late 19th century Scottish song recalling the journey of Prince Charles Edward Stuart (Bonnie Prince Charlie) from Uist to the Isle of Skye. The children put lots of emotion and feeling into their performance and it sounded beautiful. We then sang our own choice of 'We Saw the Sea' which was a real contrast. The children had great fun singing such an entertaining song which also required some actions. The children were highly praised by the adjudicator too and I am very pleased to say that we won the class. I was so proud of the children's performance and am very grateful to our wonderful music teacher, Kate Cheetham, for training the children so well; this ensured they stole the show! 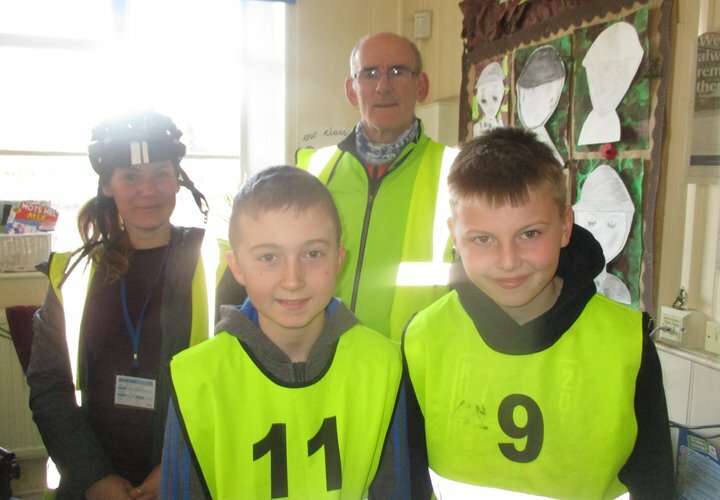 This week we welcomed Peter and Mariah to work with the Year 6 children on Bikeability Training. 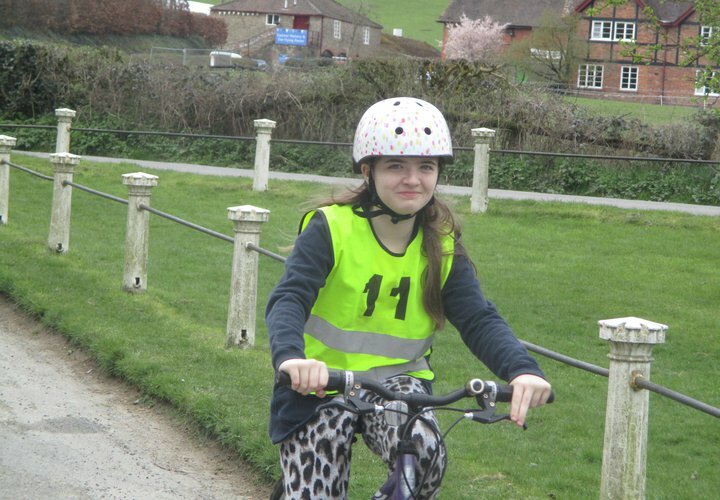 The children spent a day working on key skills to help them keep safe on their bikes. 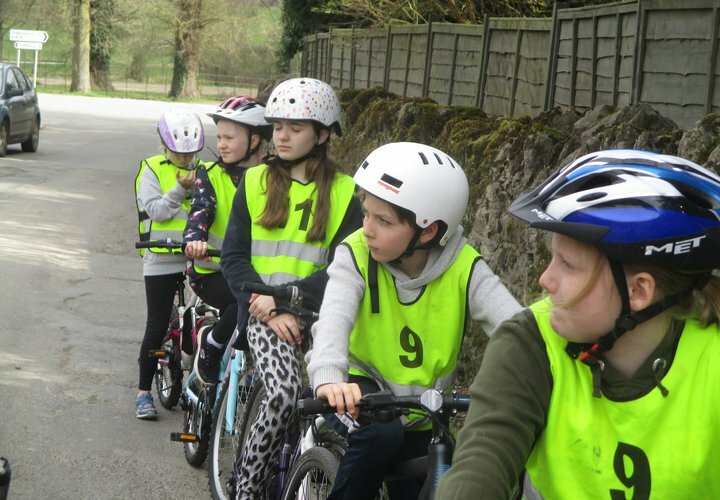 They started with simple bike maintenance such as checking helmet and tyres, before moving onto bike control involving manoeuvring their bikes around cones and in small spaces. 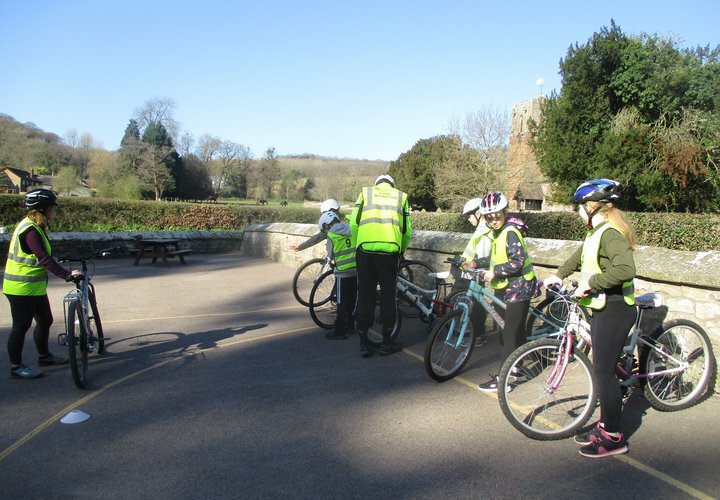 Once on the road, the children were able to practise skills such as moving off and pulling in, safety and traffic awareness at junctions and signalling and turning. Both instructors commented on the children's excellent listening skills and how they followed instructions carefully. 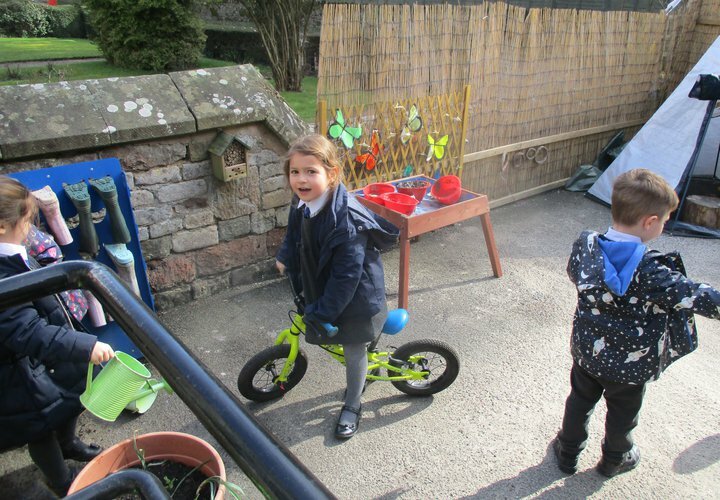 Many thanks to parents for enabling their children to take part in this valuable training by providing and transporting bikes to school. 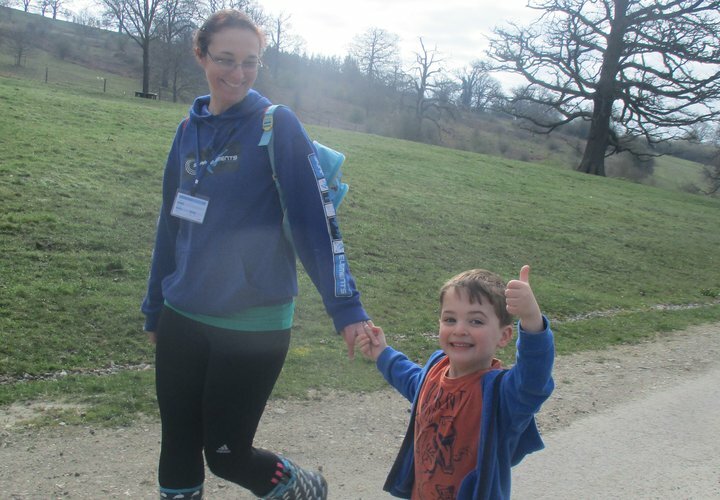 Spring Walk for Sport Relief! 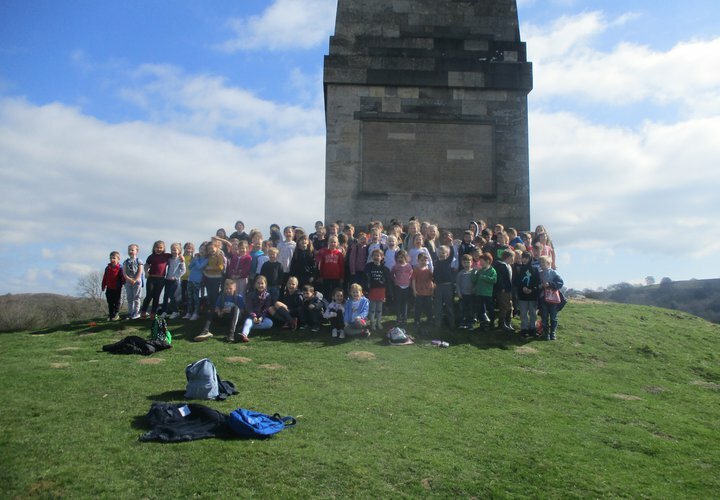 What a wonderful walk we had today to the Obelisk in aid of Sport Relief. 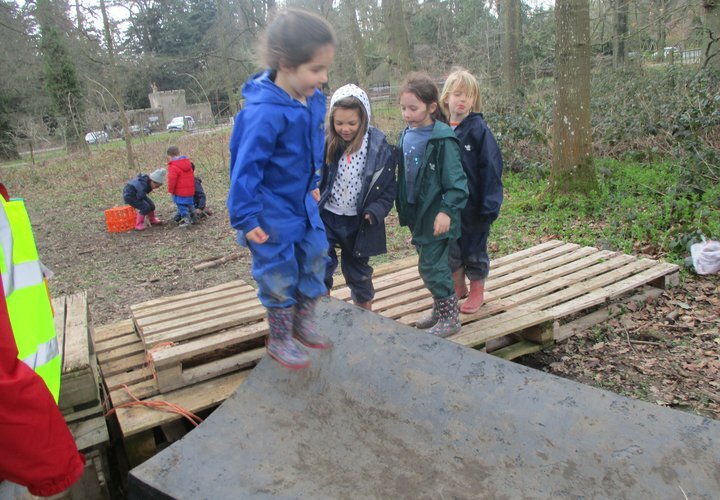 The children were all eager to conquer the challenge! It is so lovely to see all the children encouraging each other to the top and enjoying the spectacular view when we got there. As you can see from the pictures we all had a great time. Also a huge thank you to all of our helpers who kindly joined us on our walk, offering plenty of encouraging smiles along the way for those younger members of the school. Well done everyone! 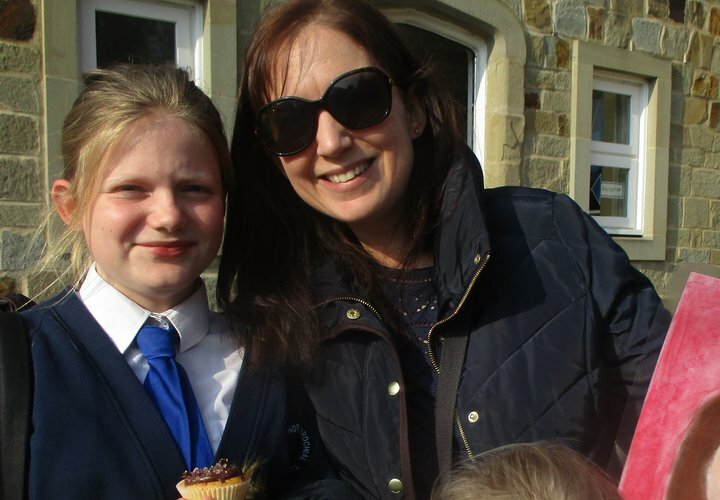 Thank you so much to all of the lovely Mums that came to our Mother’s Day Church celebrations. Mothering Sunday is celebrated in honour of motherhood. Mothering Sunday is celebrated on the 4th Sunday of Lent, exactly 3 weeks before Easter Sunday. It was lovely to see the children celebrating Mother’s Day. 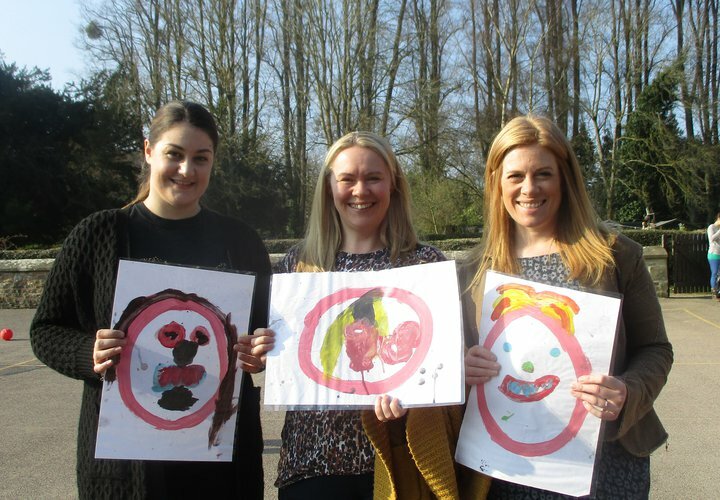 Reception, Year 1, Year 5 and Year 6 created some fantastic portraits of their Mums. They also shared some pieces of writing that were inspired by their lovely Mums. 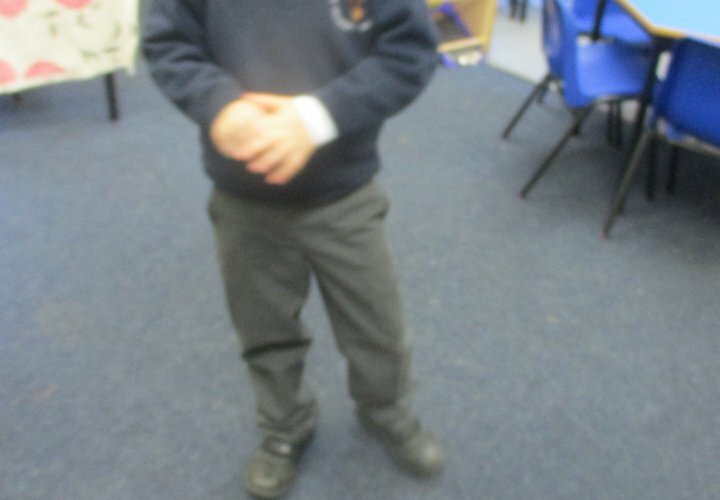 The Year 2 children sang a Mother’s Day song and Class 3 had a very unique class rap and song. Well done to all the children for your excellent efforts as always and to all our wonderful mums; we wish you a wonderful Mother's Day this coming Sunday! Well done Aria and Emily! 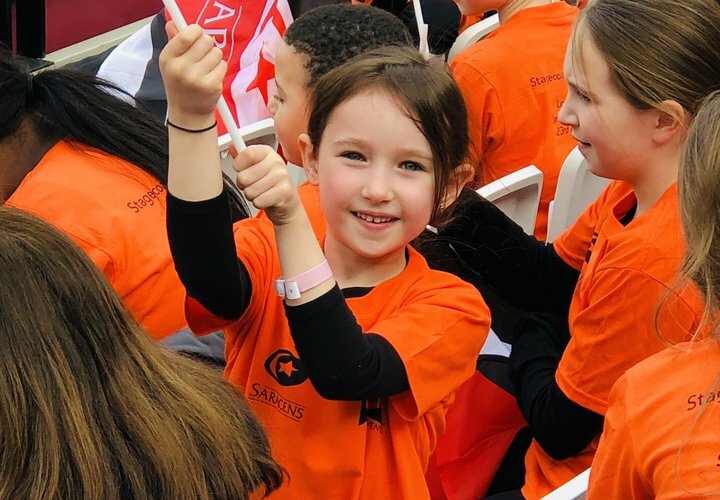 On Saturday 23rd Aria and Emily performed a medley at the Saracens v Harlequin game in London’s Olympic village with her Stagecoach group. Aria even made it onto the big screen where she was seen waving her flag. What a wonderful way to spend your weekend girls. Well done Aria and Emily, we are very proud of you. We are so proud of Goda and her achievements in Gymnastics. 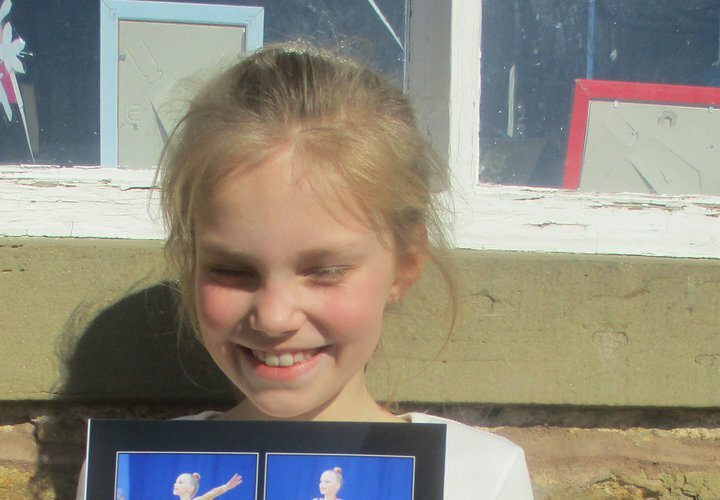 This week she took part in a championship in Stoke on Trent and she has qualified for the English Championships. Well done Goda! No need to book – just turn up on the night! If your child (or children) are keen to learn more about the game of cricket, then please bring them along to our coaching sessions. The sessions are run by qualified coaches in a fun and relaxed atmosphere. You can enjoy a drink and a burger whilst you watch!!! Running for 12 weeks (weather permitting). Summer Camp also planned – dates to be agreed. Eastnor Church, which is used daily by the School for assemblies and for special occasions like today’s Mother’s Day assembly, has been on the Buildings At Risk register for a number of years. The Church was completely rebuilt in 1851, with the exception of the 13th and 14th Century tower, and it is the tower that is now in need of restoration. Whilst it is perfectly safe to continue to use the Church, the local community is raising funds to repair the tower and will hopefully raise enough to improve facilities in the Church, such as the installation of a W.C. and a servery so that it can be used for an even wider range of activities. Applications are being made to charitable organisations, including the Heritage Lottery Fund, for grants to help with the cost of the restoration work and new facilities but we are also organising a number of fund raising activities which may be of interest to members of the School community. 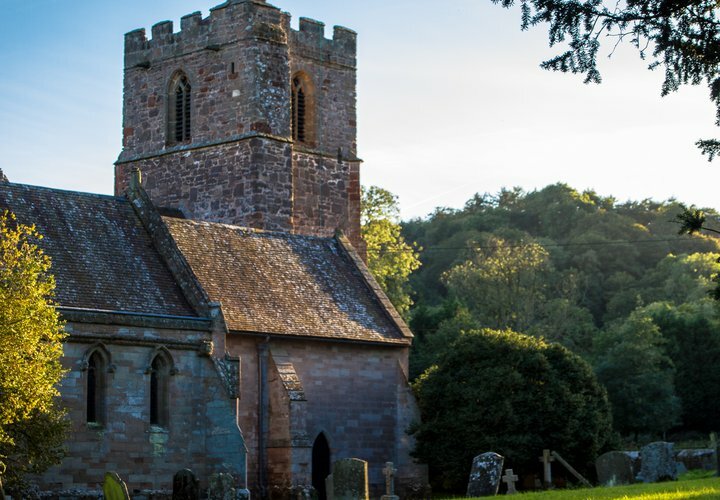 For example, on 7th June, there is to be a concert in the Church as part of the Music in Quiet Places series, in collaboration with Ledbury Amateur Dramatic Society, a Murder Mystery Evening at Eastnor Castle as well as quiz nights at the Cricket Club (12th April) and the Castle (27th September). We have been working with Mrs Driscoll in ways in which the Church may inspire the children. Thinking about the War Memorial, and the class text, War Horse, has led to the brilliant poetry work about the First World War, some of which appeared in last week’s newsletter. There will also be a Discovery Trail for children to investigate and learn about interesting aspects of the Church building and a video in the Church about the restoration process and providing virtual access to the tower. We will continue to post in the newsletter details of fund raising events and initiatives and information on progress of the restoration, some of which will be led by the school during the summer term. 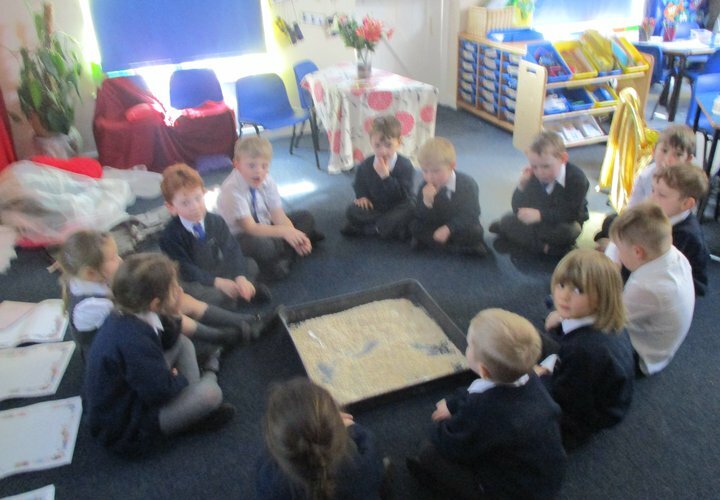 We have had a fabulous few weeks here in Class 1 – the children continue to impress me everyday, making every learning opportunity exciting and fascinating for all! We have continued looking at Traditional Tales over this term, with the very sneaky goldilocks spilling over Miss Davies’ porridge, we had no choice but to use our detective skills, writing questions to discover Goldilocks’ whereabouts. We have also enjoyed looking carefully at character descriptions using the story of Little Red Riding Hood to help us, the big bad wolf being a particular favourite amongst the reception children! 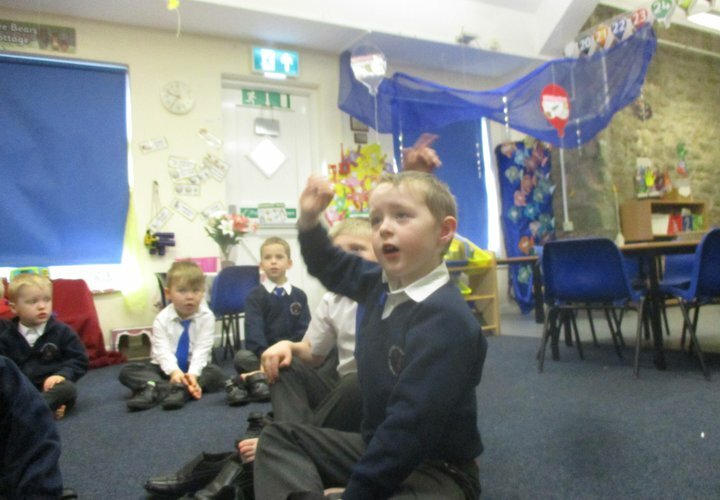 The children have used their acting skills tremendously well too with drama games such as freeze frames, hot seating and thought tapping, helping the children to really get into the mind-set of some of those key characters. This week and last week the children have been trying to catch that very cheeky gingerbread man and even when we baked our own, some still managed to sneak away! 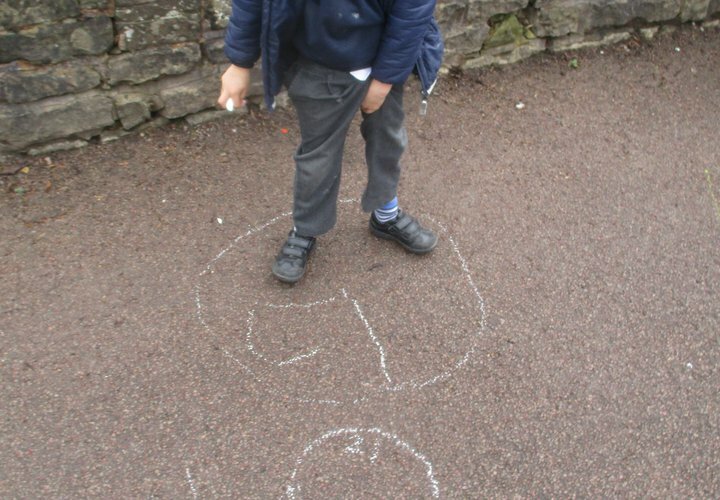 In our Mathematics, the children continue to develop fantastic number skills, linked particularly to number bonds to 10, developing their mental skills rapidly as well as looking at doubling and halving, using mini beast paintings such as ladybirds and butterflies to help us! Last week the children enjoyed exploring money with the year 1 children, recognising key features of each coin before beginning to combine them to buy those all important snacks, all healthy of course! 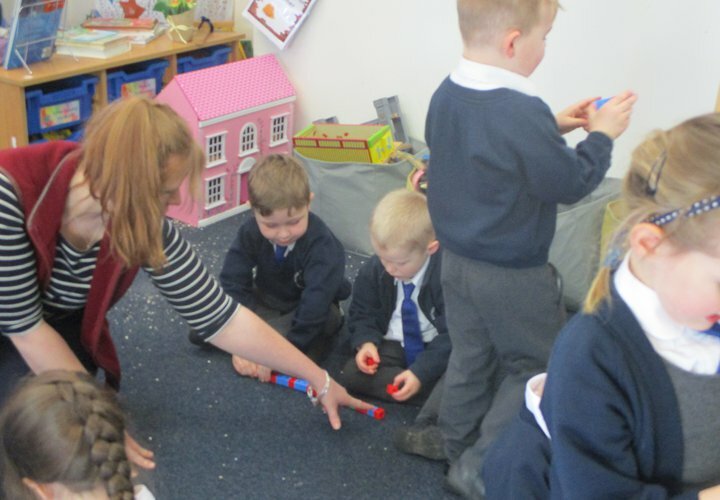 This week the children have enjoyed looking at capacity, using lots of fun objects to measure full, empty and half full – what fun we’ve had. 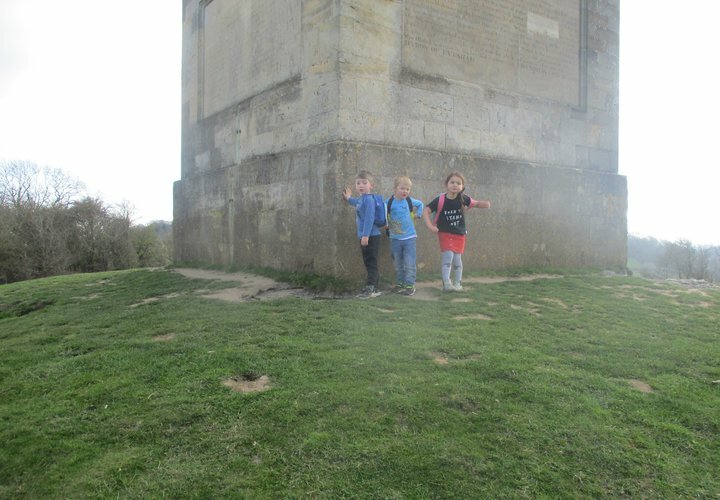 In other areas the Reception children completed their first voyage up to the obelisk and what a fantastic job they all did – wow! You all kept going even when you were all getting very tired and I hope you are all very proud of yourself – well done everybody! 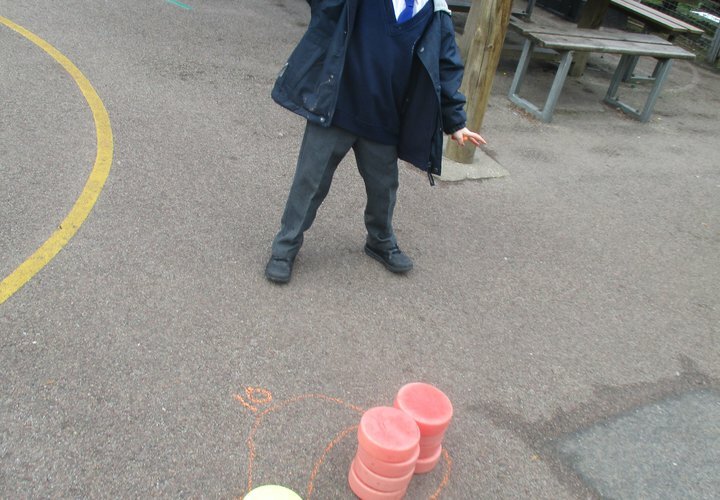 The children have continued to work tremendously hard with Mrs Dawe too and I know how super impressed she is with those key fundamental skills they are developing through a variety of game based activities. The children have enjoyed exploring collage, making lots of mess using all sorts of resources to help them and it is quite clear to see how many keen artists we have amongst the group, what lovely master pieces you have created! 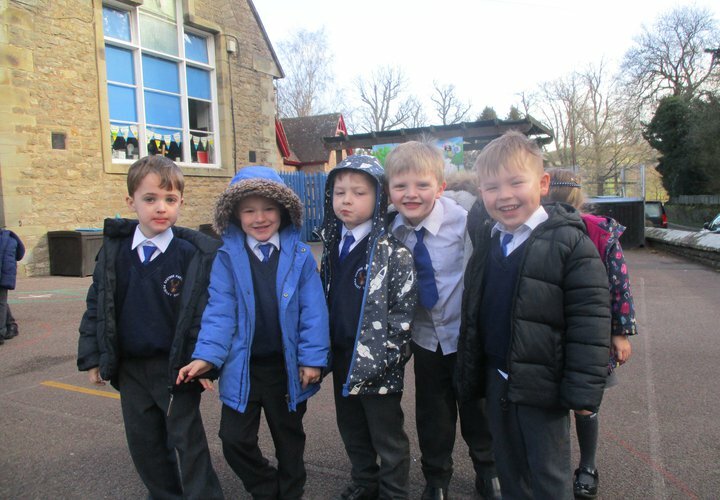 The Reception children are doing a fantastic job, considering they are the youngest members of the school, they continue to amaze me everyday with their great stamina, enthusiasm and willingness for all parts of school life – well done all of you. William for a wonderful character description profile this week! Well done Will! Anna for creating a fantastic piece of descriptive writing about her Mum. You used some great adjectives and similes, well done Anna! Oscar for amazing general knowledge whilst writing riddles. Very impressive! Grace for trying so hard with her writing this week, you are using some great vocabulary. Well done Grace! Kian for fantastic maths work and for working hard in all subjects. Well done Kian! Grace for her fantastic portrait - you showed different skills and persevered to achieve a wonderful end result. Well done! Keanu for his super work in Maths and English recently. You have shown real determination to improve - and you have! Well done! For the amazing children who took part in the poetry recital classes at the Herefordshire Performing Arts Festival this week. 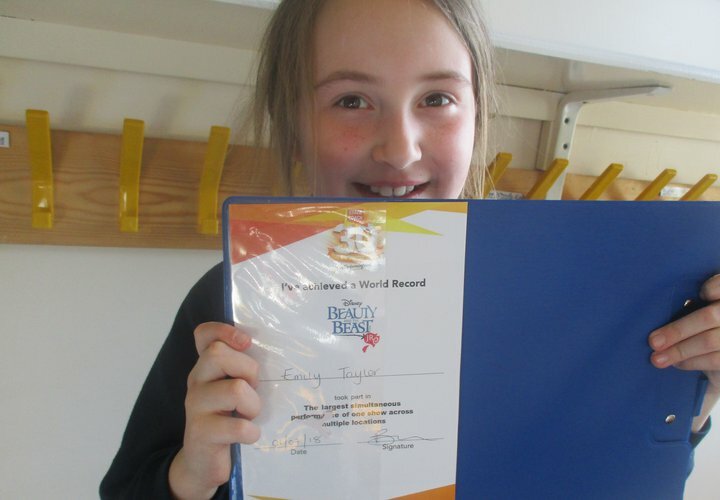 Well done to Rosie, Anna, Goda, Eva, Emily, Libby, Eleanor, Lily B and Heidi. You were all brilliant and really did yourselves and everyone at school very proud!